← What’s Wrong With Ask Ashley? Father’s Day is meant to be a day of joy and happiness. So, why is that so many women turn it into a day of bitterness and anger? I’ll admit that I have a few pet peeves, and this just happens to be one of them. It bothers me that so many women spew out so much negativity on Father’s Day because the father of their child(ren) is a deadbeat. Well, Father’s Day is not meant to shine light on those who are not doing a sufficient job, but to shed light on those who are. I am in no way taking away from single mothers either. I have no issue commending a single mother for a job well done. While showing appreciation to mothers should be done year-round, their special day is Mother’s Day. Mother’s Day includes married mothers AND single mothers. 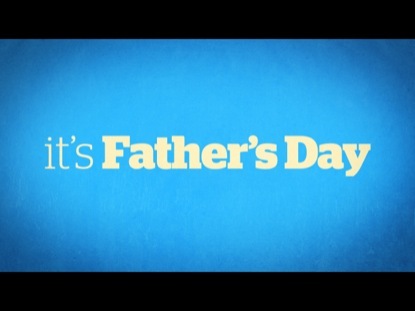 So, why is it so hard to let the Fathers have their day? I’m quite sure there is a man in your life whom of which you can wish a Happy Father’s Day to. It’s not hard to update a Facebook status with, “Happy Father’s Day to all of the Fathers out there.”Period. However, some women HAVE to update their Facebook with statues like “Happy Father’s Day to me because my baby daddy is a deadbeat, or “Happy Father’s Day to all the single mothers who are also fathers.” Is that not a conflict in itself? You’re wishing single mothers a Happy Father’s Day. Ladies, you can be a super single mother, who puts in double duty and does a damn good job at it. I know plenty of excellent single mothers, including my best friend, Aunt, Grandma and Nana. However, in my opinion, a single mother cannot be a father. A father is a man who has created a child, not a woman who has to raise a child alone. For the single mothers, I think it’s important to just focus on being the best mother you can be. Updating your social media sites with statues about how the father of your child(ren) is no good only allows others to know what’s going on in your household, and it shows that you’re still holding on to something you should probably let go of. If you want people to know your business and still want to hold on to the issue, then update your status year-round and not just on Father’s Day. I also think that in a lot of cases, you knew the type of man you were lying down with and it shouldn’t have been a surprise to you that he wasn’t going to be a good father. You probably saw several signs, but chose to ignore it for whatever reason. Now, you’re upset that he upheld his reputation. If he wasn’t good to you, what makes you think he’ll be good to your child(ren)? Not to mention, you’re not married. So, he has no obligation to stick around. Think smarter not harder. I do understand there are other circumstances and different scenarios; I’ll definitely acknowledge that. No day that is supposed to be a celebration should have so many negative connotations attached to it. Mother’s Day is NEVER filled with as much negativity as Father’s Day. It’s not right nor is it fair. All I’m saying is that please let the good Fathers have their day. That’s what they deserve. Save the drama for the other 364 days of the year. Posted on Mon.Jun.17.2013, in Life Lessons and tagged blogger, Child, children, Dad, daddy, Dads, Father of your children, Father's Day, Fathers, Happy Father's Day, home, Justice for fathers, kid, kids, LBlogger, Life Lessons, lifestyle, love, Mother's Day, motherhood, mothers, negative, negativity, Papa, positive, relationships, single fathers, single moms, Single mother, single-parent, support. Bookmark the permalink. 4 Comments. Amen. I don’t see single dads bashing the moms on Mother’s Day. Not to say they don’t but I just don’t see it. I used to be guilty of telling single moms Happy Father’s Day. Glad I changed. I don’t see the bashing on Mother’s Day either. lol! Glad, you changed too! lol! 🙂 Thanks for commenting! I tried so hard yesterday to find a way to say this eloquently. I failed. But you succeeded! THANK YOU for this post!! I was a Single Mother for years, and although I feel like I had more than my fair share of struggles, it never took away from the celebration that my kids had on Father’s day. It just didn’t. Plain & simple. It wasn’t that hard to not make Father’s Day about me, b/c it simply wasn’t & isn’t. It was about my Boys & what they knew & understood about that day. I think it all comes with healing & maturity. Some dads don’t deserve to be commended. So don’t do it. But don’t bash the entire holiday either b/c there are some Dads who do a terrific job. Don’t hate on them b/c you reproduced with the wrong one! I’m glad that I could say it for the both of us! 🙂 What you’re saying is very true though. Father’s Day is not about the single mothers doing double duty; its about the fathers doing their job. Period. Don’t get me started on the bad Dads. lol! Thanks for commenting!